As I've already told you, one of my top travel resolutions for 2010 was to take more road trips. We kicked off the new year with a road trip to Washington D.C., and this past weekend, we packed up the car again and headed to our old stomping ground...Philadelphia!!! 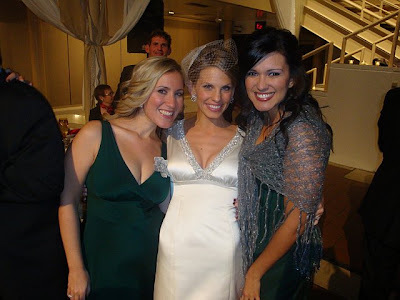 We drove to the city of brotherly love for my friend's gorgeous and fun wedding! 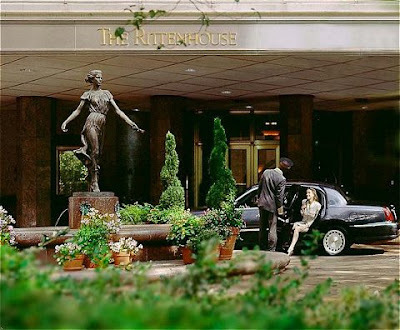 One of the best parts of the weekend, was getting to stay at the Rittenhouse Hotel. 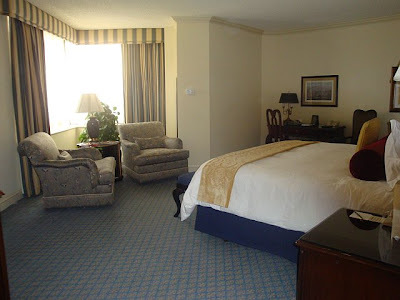 I would say it's comparable to The Plaza Hotel in New York City, and I had always wanted to stay at the Rittenhouse, so this was the perfect excuse. 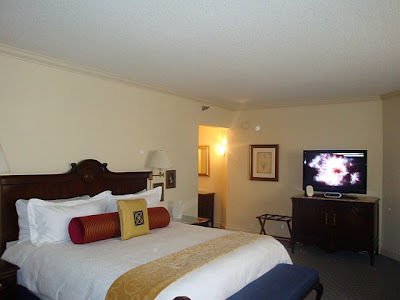 The room was big and beautiful, and the service was impeccable! 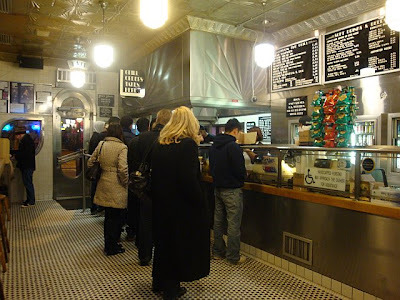 Dinner Friday night was at Stephen Starr's Butcher & Singer. 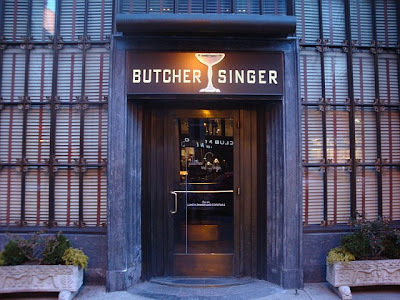 Butcher & Singer is not your typical steakhouse. It's very 1940's, both in decor and in their menu. 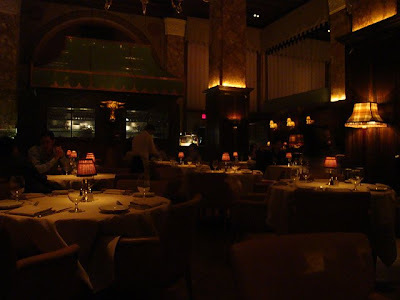 We had their Steak Delmonico which is a typical 1940's cut of steak. 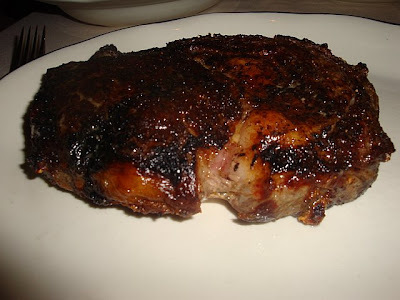 It came perfectly charred on the outside and excellently cooked on the inside. 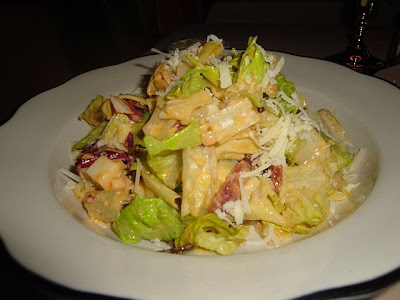 We also had their Butcher Salad... and the Stuffed Hash Browns. 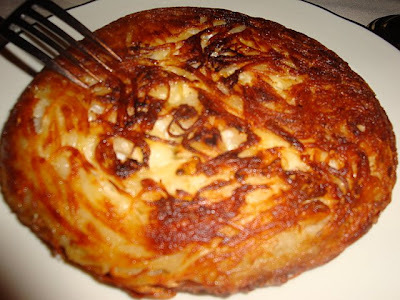 They are creamy on the inside and crispy on the outside. They are also written up in Philadelphia Magazine's 239 Dishes You Must Eat Right Now article- so we knew we had to try them. Wow! 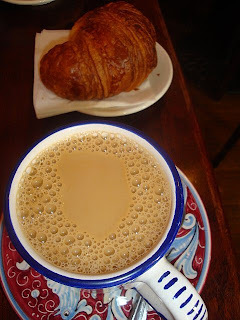 Morning coffee and croissants were always enjoyed at our favorite spot which is around the corner from the Rittenhouse...La Colombe. 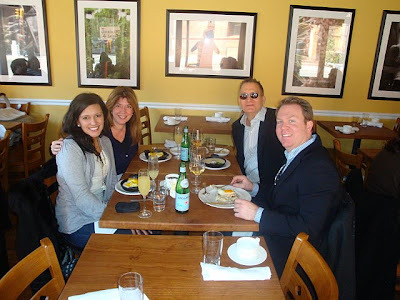 On Sunday, we met up with our friends, Steve and Carla, and headed to Meme Restaurant (2201 Spruce Street) for brunch. 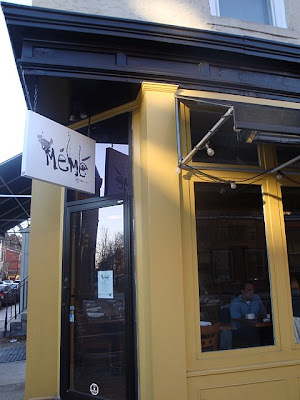 Meme is in the same space where one of our other favorite Philly restaurants used to be. It's small, casual, rustic and unpretentious. 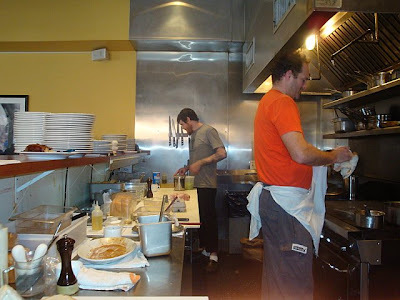 It also has an open kitchen, which I just love. 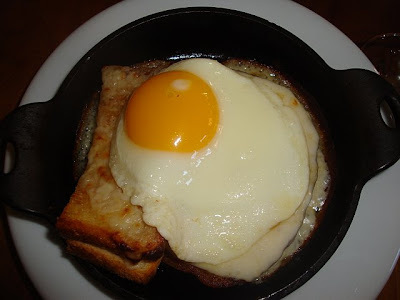 They recently added brunch to their menu and Steve and Carla raved about it, so we thought we'd give it a try, and boy was it amazing!!! 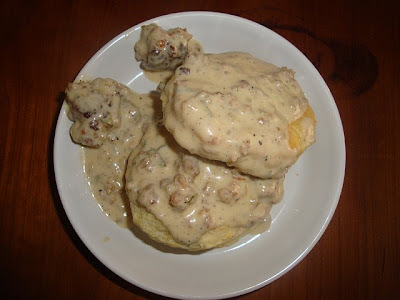 Steve and Carla had a side dish of their Biscuit & Sausage Gravy for $3 (their sausage is homemade, by the way). 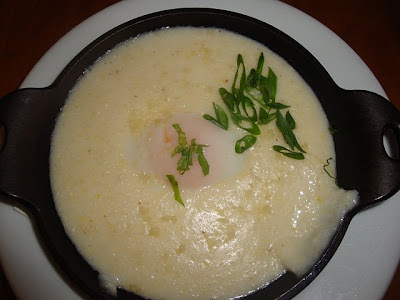 Steve ordered their Anson Mills Cheddar Grits with a poached egg for $10. 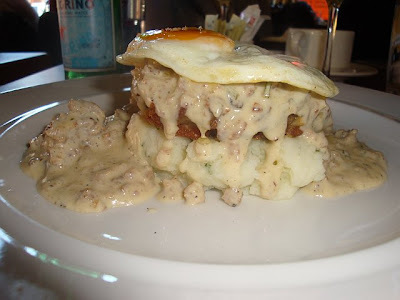 Rich had The Heart Stopper II- which comes with pan fried pork shoulder, buttermilk mashed potatoes, sausage gravy, and a sunny side up egg for $13. Carla & I both had their Croque Madame for $10 which (other than Paris) was the best Croque Madame I had ever had in my life! 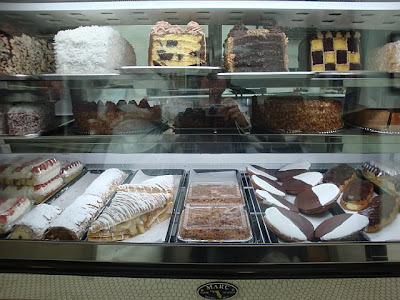 I am drooling just thinking about it right now. 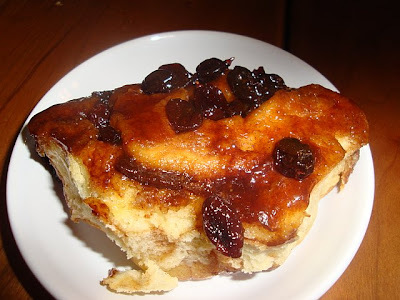 For dessert, we had their sticky bun for $3, which was pure sticky goodness!!! It was so good catching up with our friends and checking out a great restaurant! 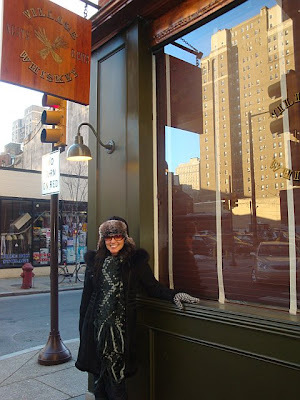 Afterwards, we wandered around Rittenhouse Square to check out all the things that had changed in our old neighborhood. 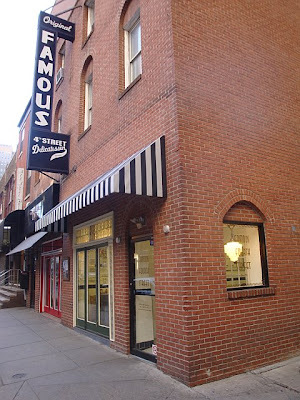 We noticed that they opened up a Famous 4th Street Deli. Originally just in South Philadelphia and Reading Terminal Market, this new one is on 19th street! (38 South 19th Street) Of course we stopped in and ordered some of their delicious chocolate chip, oatmeal raisin and black and white cookies. 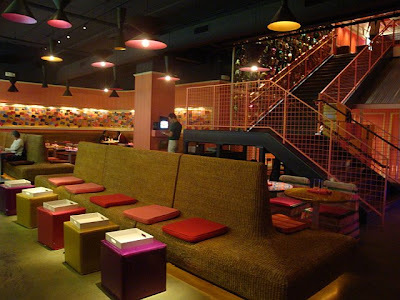 We also stumbled upon Village Whiskey (118 South 20th Street) which is owned by the fabulous Chef Jose Garces! The bar wasn't serving at the time, but it definitely looks like a spot we will be checking out the next time we are in Philly. 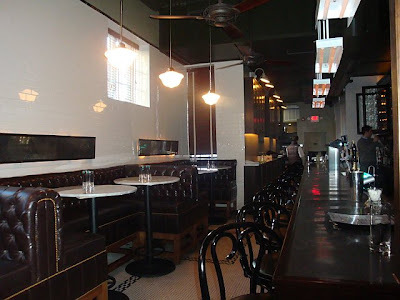 Just love the subway tiles on the walls and the high leather booths...very hipster! 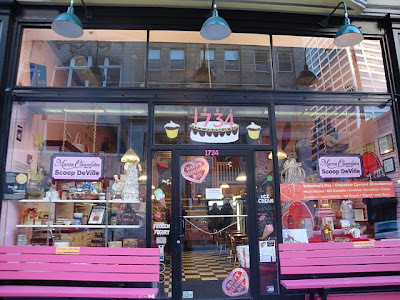 For a little dessert, we went to Scoop De Ville (1734 Chestnut Street). 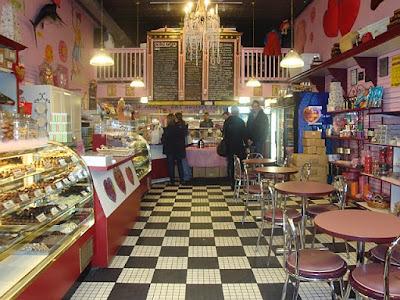 This pretty little ice cream shop will blend together any flavor your little heart desires into something yummy and different. We went for something else we read in Philadelphia Magazine's 239 Dishes You Must Eat Right Now article...vanilla ice cream, blended with oreo cookies and peanut butter cups. It's actually Chef Jennifer Carroll's (she was on Bravo's Top Chef & she also is a chef at 10 Arts Bistro & Lounge in Philly) "secret obsession" dish that she dreams about. Oh my gosh...once you try it, you will be dreaming about it too!!! 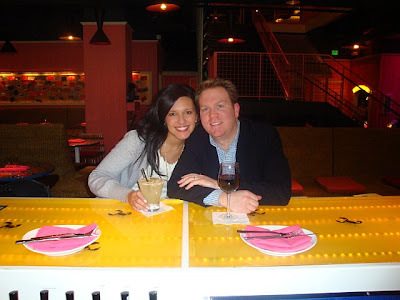 By this time, we had worked up another little appetite, and headed to Distrito. 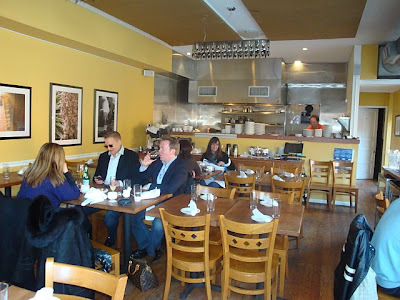 (3945 Chestnut Street) Also owned by Chef Jose Garces, this is a new Mexican restaurant located in University City. 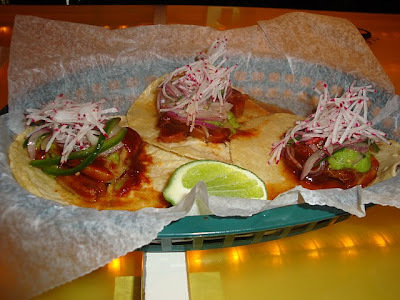 We had read about their Lengua or Tongue Tacos and decided to order them. I have to say, this was the first time I tried tongue and was sort of grossed out by the idea, but have to say that they were excellent and tasted just like pork! 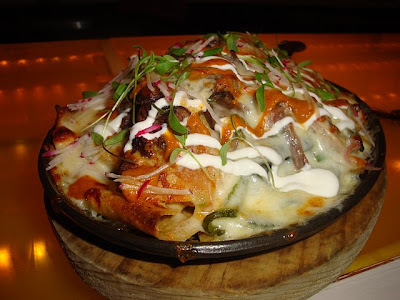 We also had their steak nachos (another dish from Philadelphia Magazine's 239 best)...and they rocked! 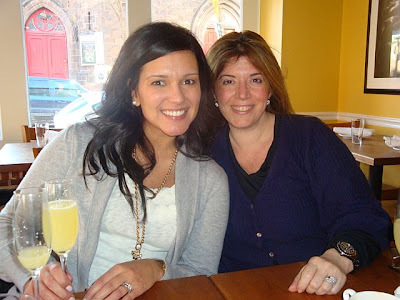 A little margarita with salt on the rocks to wash it all down, and we were content! Yes, I know you are probably thinking, how can they just eat and eat and eat, but when we jet set, we like to try everything just in case we don't get back to that place again. So where did we go next??? 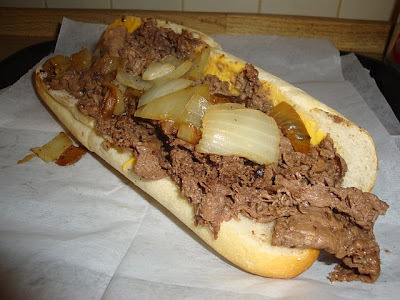 For Philly cheese steaks of course!!! 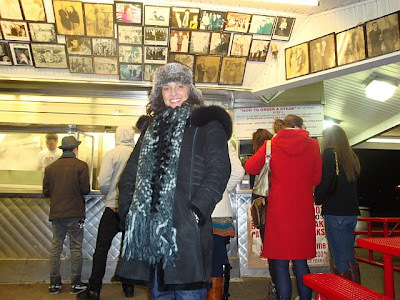 First we went to Jim's Steaks. 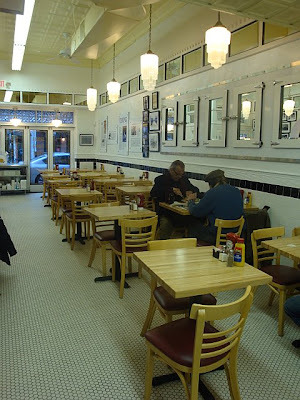 (400 South Street) We ordered one whiz wit (with Cheeze Whiz & Onions). I scarfed it down quickly it was so good. 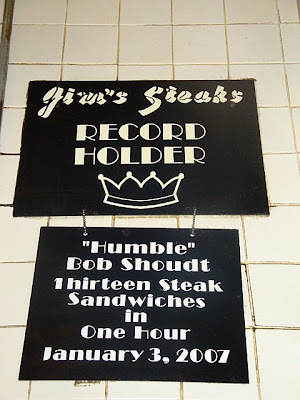 Look at this Record Holder sign inside the restaurant...I love to eat, but could you ever? Not me! 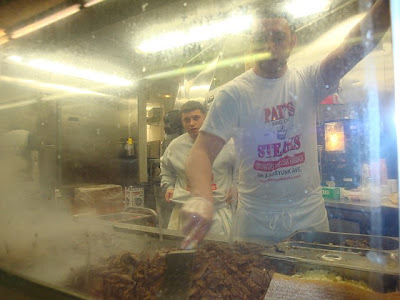 Next, we headed to Pat's Steaks (1237 East Passyunk Avenue) for another whiz wit. 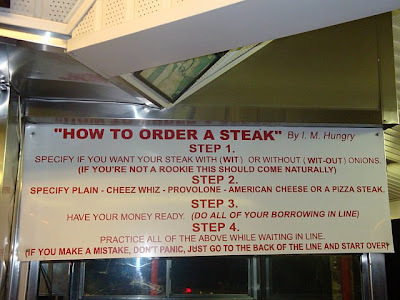 You have to know how you want to order your cheese steak before you get to the window! We had a great time being back in Philly! We hope to make it back there again soon! Looks like you had fun here in Philly. 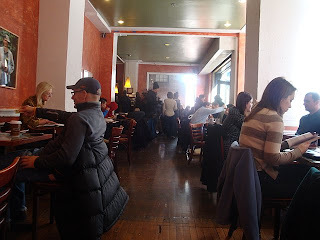 Thanks for the write up about Scoop DeVille. Glad you enjoyed yourself. Sorry I did not get a chance to meet you in person. Matt Shore - Owner, Scoop DeVille. I love this. it's fabulous and makes me want to leave for Philly right now.